When international organisations declare a crisis over and refugee camps are closed, what happens to those who remain? Oliver Tringham reports on a pilot community project to restore rights and create livelihoods for refugees forgotten in the wake of the Arab Spring. The refugee camp at Choucha in the South of Tunisia looked like a festival when I first visited in April 2011: thousands of tents stretching into the distant haze, people of many different nationalities milling around, organizers ineffectually directing the crowds… In the early hours of 24 May 2011, this first phase of the camp’s existence came to an abrupt end, when a group of men came out to the camp from the nearby town of Ben Gardène to teach the refugees a lesson. On the afternoon of the previous day, in a short-lived protest, the refugees had briefly closed the road to the border. Ben Gardène depends on this road, and the town’s merchants didn’t take kindly to it being shut. The lucky refugees watched from the desert darkness, as the camp went up in flames. Later, they were able to tell how the Tunisian Army stood by and watched, as the less fortunate refugees were killed by the local thugs. Almost one million people fled the fighting in Libya as the Arab Spring that had begun in Tunisia spread to its neighbour. Many of the Libyan refugees were taken in by Southern Tunisian families in a magnificent demonstration of traditional hospitality. The UN Refugee Agency (UNHCR) and International Organisation of Migraton (IOM) organized a massive airlift for Gaddafi’s guest workers: almost a quarter of a million migrants were airlifted back to their countries of origin. Around 4,500 declined to get on the planes: they said they were frightened they would be imprisoned, tortured, or most likely killed, if they returned ‘home.’ UNHCR therefore set about deciding whether their fears of persecution were well-founded: if they were, the individuals could be given refugee status according to the Geneva Convention of which Tunisia was a signatory. UNHCR initiated the Global Resettlement Solidarity Initiative which meant that everyone with status would be resettled in a developed country. View from the inside of a tent at Choucha. The interpreters UNHCR hired were other inhabitants of the camp: people who could speak some English, French or Arabic as well as their African mother languages. Interpreting into your mother tongue is one thing: interpreting from your mother tongue to another language is much more difficult. Interpreting effectively between two languages, neither of which is your mother tongue, is much more difficult again. ‘Twenty-nine persons within the Darfurian community of Arab origin… complained that the interpreter… belonged to the enemy conflict party in Sudan and was therefore prejudiced and biased… The refugees of this community stated before beginning the interview, that this interpreter was biased and that they would not be able to explain their reasons for flight in the presence of this person. Instead of finding an acceptable interpreter, UNHCR staff insisted on continuing the interview with this interpreter. After their first rejection many individuals of this community appealed, arguing that the interpreter was biased. Surprisingly they found the same interpreter in the second [appeal] interview over again. All twenty-nine were subsequently rejected by UNHCR. There was no-one at Choucha providing legal advice (not even a leaflet), to help the refugees through the process of Refugee Status Determination. None of them knew for example, that they had the right to stop an interview and ask for another interpreter – and as the above example shows, even when they did complain, their rights were not respected. Using camp inhabitants as interpreters also inhibited asylum seekers from providing the full facts of their cases, as refugees seldom want others in the camp to know the details of their personal traumas and history. After all, your history is the only thing you have got left, once you have lost all your possessions, and even perhaps your family. 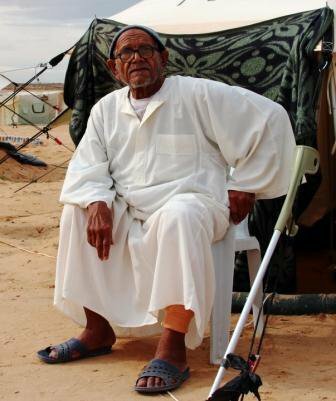 With the assassination of Gaddafi in October 2011, the flow of refugees diminished. UNHCR set a cut-off date of 1 December: any refugees arriving after this would not be resettled in another country. It was the end of new arrivals for the Global Solidarity Resettlement Initiative, however the camp wasn’t officially closed until almost two years later (on 30 June 2013). An asylum-seeker at Choucha, rejected by UNHCR. 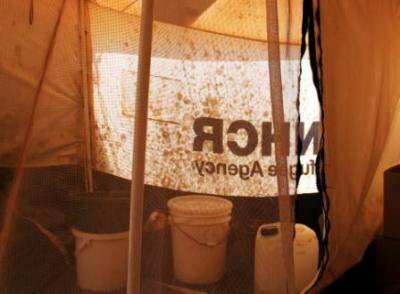 During this period, UNHCR gradually put increasing pressure on those left at Choucha to leave. The refugees with status who had arrived after the deadline were encouraged to move into towns in the region. The German Government gave a €600,000 grant for integrating most of this group (around 400 people) into the town of Medenine. The project seems to have been a fairly comprehensive failure: the refugees complained of racism and religious intolerance and took to demonstrating outside UNHCR’s offices, before mostly returning en masse to the camp. A small number continue their protest outside UNHCR’s Tunis office to this day. Those who had been refused refugee status have been subject to the greatest pressure. In the Autumn of 2012, they were all sacked from their jobs in the camp, and the camp school closed down. On 24 October 2012, those who had been refused status suddenly discovered that they were being refused food, too: pregnant women, children, the disabled: no exceptions. Furthermore, UNHCR warned the refugees with status not to help those who had been refused: not to share their own meagre supplies (even if they came from the same country or community), not to give them money – not even to talk to them. At the same time, IOM advertised free flights back to their countries of origin, and the promise of grants to help them get established there. However, the refused asylum-seekers refused to leave. In April 2013, electricity to the tents was cut: UNHCR claimed that they couldn’t pay the bill, although ripping out the cables is an unusual reaction for an unpaid bill. Then UNHCR cut off the drinking water. The Tunisian Ministry for Social Affairs managed to get this reinstated, although the supply was intermittent at best after this. When the camp officially closed, the water supply was cut definitively. During Ramadan (July 2014), a religious group from Ben Gardène brought out food for the refugees every evening. When Ramadan ended, with Eid, they ceased, and so the refugee women and children took to begging by the side of the road. In July 2013, the Tunisian Prime Minister promised cartes de séjours, accommodation, access to medical services and education, and even employment for those left at Choucha. In some ways, fine words make broken promises even worse. The UN Human Rights Council sent a delegation to Choucha after a report had been submitted to the Council by various NGO’s. The delegates managed to get to Ben Gardène from Geneva, but mysteriously failed to travel the remaining 26 km to the camp. As time passed, we (individuals working mainly under the aegis of South Devon Multicultural Forum and Association Planète Positive) decided to focus our energies on working with the refugees who had been rejected – partly because they were the easiest to work with (we didn’t have to go through UNHCR); mainly, because their situation was the most precarious. Food from the camp’s kitchens had been meagre, so that many communities were already supplementing the official diet. Consequently, although the kitchens were shut, and food cut off, no-one starved. At first UNHCR appeared bemused by its strategy’s lack of effect. As always, the biggest impact was on the weakest and most vulnerable. We did what we could for them, providing blankets, warm clothes, baby food, etc. Morale is key to survival in harsh conditions, so that perhaps the most significant effect of our slender efforts was in boosting morale – confirming that there was someone in the outside world who still remembered those left in the camp. We also continued to work on UNHCR with the aim of re-opening the four cases whose testimonies we had taken in January 2013. Those who felt that they had been wrongly rejected were keen to have the injustice remedied, although they had few illusions that this would result in any improvement to their living conditions. More recently, we have put more of our efforts into moving a small group of the refused refugees out of the camp and into Tataouine. We wanted to learn the lessons of the Medenine experience, chief among which seemed to be the question of scale, so we moved only a small group into the local neighbourhood. We had already established connections between the refugees and local civil society, through participation of the former in recent festivals for the disabled. We also obtained authorization from the Ministry for Social Affairs although the refugees still have not received their cartes de séjours (residence permits). This absence of legal status was one of several problems we had when getting the refugees out of Choucha. The army officer at the camp entrance insisted on written and stamped permission from M. le Délégué, the local commissar. This august official had sent almost all his staff home due to the mobs rampaging through Ben Gardène that day; clearly however, he was not a man to buckle under pressure. We sat in his office as he juggled telephones to the accompaniment of breaking glass and gunshots outside. He was less inclined however, to take risks in the bureaucratic sphere. Fortunately, our friends in the Ministry for Social Affairs were able to confirm the authenticity of our pilot project’s approval, and after finding what felt like the last functioning photocopier in the town (the Délégué’s was locked up and the key taken home), we returned to the camp with our documents. The border was shut and the road to Choucha deserted, as we drove out to pick up the refugees and their belongings. The wind was blowing hard, and sand had covered the track to the tents, but we just managed to find out way in… and out again. If this project is successful, it could be a model for creating sustainable ways out of Choucha for the remaining few hundred people living there. Many of those with enough money and courage have gone back to Libya and several have successfully managed to get to Europe. We don’t know – no-one knows – how many have drowned. New stone-working micro-business, set up as part of Peace in the Desert.